When I bought this book, I had the fear that there's going to be a rehash of content that has already appeared in Alien Vault whose content was also a rehash of an earlier book called The Book of Alien. With the book in hand, I do see that there are duplication but it's perhaps unavoidable because it covers all the four films from the franchise. Duplication mainly comes the from the first film with some similar pictures and stories from Alien Vault being reused, just laid out differently. For me, it's not a major bummer because the whole is greater than the sum of its parts. 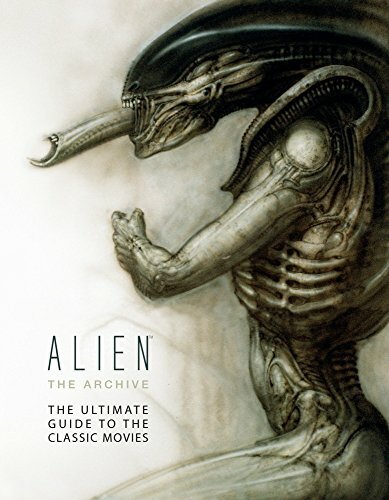 Alien the Archive is presented as a huge 304-page hardcover published by Titan Books, who have also recently released another Alien-related book called The Art of Alien: Isolation, an awesome video game artbook by the way. This is a visually driven book with the large pictures and supporting text. From cover to cover, it's filled with wonderful photographs and artworks that are gloriously reproduced on the huge pages. The book starts off an interesting analysis of Sigourney Weaver's character Ellen Ripley before going into the specific films. It looks at the casting and at how Ripley had evolved in the Alien universe. It's a nice way to connect the films together using a common element. Content for each film features the history and production process, the cast, designs for the environment, spaceships, and the alien, all in the at order. The text overall is insightful and informative. However, history for each film is rather brief but this isn't a detailed production diary so it's not surprising. The other text comes in the form of interviews, captions and commentary explaining the designs, filming process and the work that is done. The paragraphs here and there plus snippets of text all add up to a huge amount of content to read. The text reveals interesting details like how they construct the spaceships, art direction, the artists who are involved, difficulties on filming Alien 3, creating of sets and of course the alien, and the different aspects that each film faces. The behind the scenes photographs are really great and fun to look at. You can see the actual models for spaceships and sets, alien suits, many of the alien props including the mechanical parts that control the movements, actors, the filming process and more. There are many new pictures that I've not seen before because I've not seen companion books for the second to fourth film. The included artworks are fantastic. There are artworks from Chris Foss, Moebius, H.R. Giger and other artists. H.R. Giger contribution is the most significant with designs for the alien, its environment and other elements. You'll also see concept art and sketches for the spaceship interiors, vehicles, props, storyboards and physical models such as maquettes and miniatures. So despite some duplication of content from other books, I still think this is a fine companion to the Alien franchise. Highly recommended to the fans.